In this article, you will learn to create 3D plots. Also, you will learn to add title, change viewing direction, and add color and shade to the plot. There are many functions in R programming for creating 3D plots. In this section, we will discuss on the persp() function which can be used to create 3D surfaces in perspective view. 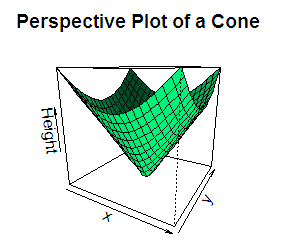 Let’s plot a cone. A simple right circular cone can be obtained with the following function. Now let’s prepare our variables. We used the function seq() to generate vector of equally spaced numbers. Then, we used the outer() function to apply the function cone at every combination of x and y. 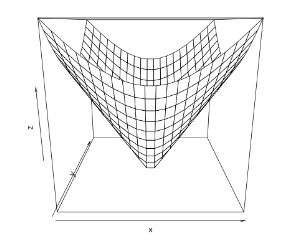 Finally, plot the 3D surface as follows. We can add a title to our plot with the parameter main. Similarly, xlab, ylab and zlab can be used to label the three axes. We can define the viewing direction using parameters theta and phi. By default theta, azimuthal direction, is 0 and phi, colatitude direction, is 15. Coloring of the plot is done with parameter col. Similarly, we can add shading with the parameter shade.